A few weeks back, I attended the National Sports Card Convention, which was held right outside of Chicago. I was hoping to find at least one moderately-priced card from the 1963-64 Parkhurst set. But that did not happen. Sometimes you find what you seek, and sometimes you don’t. 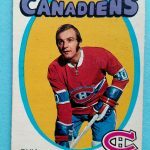 I think that, after nearly 20 years of hockey card collecting, the key is to be open to deals that you are not necessarily looking for. So, while I did not get any cards from that landmark set, I still made an interesting purchase, acquiring three pricey cards and two oddball items. This was an insert in the 1971-72 Topps set–and coincidentally, the last of the mini comic I needed to complete the 24-book set. The last two pages have a crease on the corner (a bit “dog-eared”), but there is hardly any yellowing and the colors are still bright. I absolutely love the design of the 1971-72 sets. Since I already have the entire Topps series from that year, I decided to turn my attention to the larger O-Pee-Chee issue. 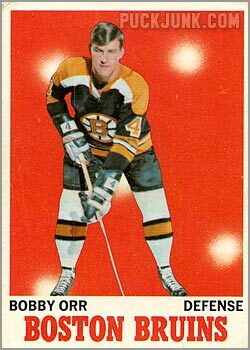 Dionne was a hell of a player, and is one of the pricer cards in this set. This card is not perfect–it has soft corners at the bottom and two very light creases…so light, that I did not even notice at time of purchase. 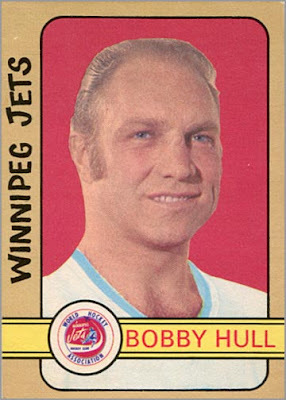 The ’72-73 OPC set intrigues me because it uses many different photos than those used on the ’72-73 Topps cards. 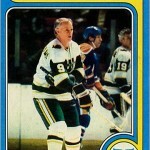 Plus, there are cards of players from the World Hockey Association. 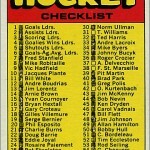 This is the most expensive checklist in the set–even more so because this is the error card variation. Card #334 was printed twice–earlier incarnations list cards 335 to 341 as “More W.H.A. 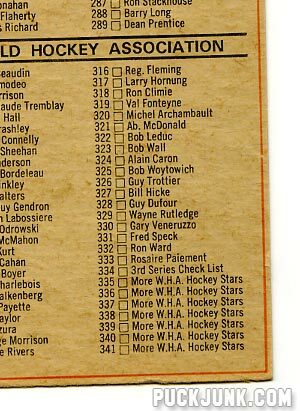 Hockey Stars”, while the card printed later corrected this, listing the actual names of the players. This checklist is unmarked, and surprisingly in good condition, with relatively sharp corners and decent centering. A neat little find, this undersized card is also a sticker. I didn’t know the likelihood of finding one of these again, so I snapped it up. I have written about this card here. This was from an insert set in the 1994 Upper Deck World Cup Soccer set. Apparently, Gretzky was one of several “Honorary Captains”. I think the Charlton Guide lists this at $20, but I could be mistaken. So, what did I pay for all of this hockey goodness? The dealer sold all five of these cards to me for $60 USD. I feel I got a pretty sweet deal. But what do you think? Did I do good? Or were the old cards too low-grade for your tastes? Wow, nice Dionne rookie. That’s a great looking set.